Clearly, acne is a problem that affects many people, 85 percent of young adults (between ages 12 and 24) who suffer from acne, 25 percent will have permanent scars from acne. Acne is a term for plugged pores, pimples, and cysts. If a pore becomes clogged, then closes and bulges out, you have a whitehead (also known as a closed comedone). If a pore becomes clogged but stays open and the top darkens, you have a blackhead (also known as an open comedone). Two other types of acne include pimples and deeper lumps (cysts or nodules). When the walls of a pore become damaged, bacteria (called Propionibacterium acnes, or P. acnes) and dead skin can work their way under the living skin. This leaves you with a small, red infection called a pimple. Clogged pores that are deep in the skin cause cysts. These infections are generally larger than those that cause pimples. The causes of acne are most easily understood by looking at the three stages of the acne life cycle: clogged pores, bacteria, and inflammation. The first stage is clogged pores. Just as skin cells on the skin’s surface are constantly being sloughed off and renewed, dead skin cells are sloughed off the skin inside the pore as well. When oil and dead skin cells get trapped in the narrow opening of the pore, this can cause cells to clump and form a plug. The second stage in the acne life cycle involves the infiltration of bacteria. Normally found on the skin, the P. acnes bacteria can feed and breed inside clogged hair follicles where sebum is trapped. Your body responds by sending white blood cells to fight these bacterial invaders. This leads to the next stage in the acne life cycle—inflammation. As the body fights the bacteria, your skin becomes inflamed and small pink bumps, pimples, nodules, or cysts appear. Unfortunately, acne is more than just a temporary concern. Acne is an inflammatory condition that can result in scarring and discoloration from past acne that can actually lead to future acne. Past acne. Treatment should address the effects of past acne, such as textural damage, hyper pigmentation, and acne scars. Because acne can begin two to three weeks before blemishes are visible on your skin, the secret to controlling acne is prevention. Acne actually takes about eight to 12 weeks to treat. Dermatologists recommend a three pronged approach for topical acne treatment: First, unclog pores; second, control bacteria; and third, reduce inflammation. You should scrub your face clean in order to treat acne. This is false. Vigorous washing and scrubbing can actually irritate the skin and make acne worse. The best approach to good hygiene and acne is to gently wash your face twice a day with a mild soap, pat dry, and then use an appropriate acne treatment. You have to let acne run its course. This is false. Acne can be cleared up. By using a high quality, efficacious acne skin care treatment system, you can address the three stages of the acne life cycle: clogged pores, bacteria, and inflammation. Acne is just a cosmetic condition. This is false. While acne poses no serious threat to one’s health, it does affect the way people look and can affect the way people feel about themselves. The P. acnes bacteria that can get trapped in pores and cause acne to multiply rapidly should be controlled. Acne should be taken seriously and treated to prevent permanent physical scarring. Acne is caused by diet. This popular myth is not totally false. While thus far scientific studies have not found a solid connection between diet and acne, research is being revisited in this area. Some studies may indicate a relationship between high-glycemic foods such as sodas, pastries, and breads. Other studies have looked at the impact of dairy-rich diets on skin health. There is no correlation between stress and acne. This is false. A recent study of Stanford University students with acne suggests that such a correlation exists. Students were analyzed before and after exams. The study found that students experienced a worsening of acne when under pre-exam stress. Clearly, acne not only causes significant stress, but is also made worse by stress. When you’re under stress, your body produces stress hormones such as cortisol. Stress hormones like these may stimulate an overproduction of oil in the skin. When this excess oil mixes with dead skin cells and bacteria, it can cause acne to develop or become worse. This can, in turn, lead to more stress, plunging you into a stress-acne cycle. Acne is a condition affecting millions of people. Its effects are not only physical, but emotional as well. Fortunately, acne can be treated and prevented. A total approach to fighting acne includes addressing issues presented by past, present, and future acne. As a board certified specialist in dermatology, Dr. Kimball advises Nu Skin on disorders such as psoriasis, atopic dermatitis, acne, and superficial basal cell carcinoma. She is the director of the Clinical Unit for Research Trials in Skin at Harvard Medical School and serves as chair of the Workforce Taskforce for the American Academy of Dermatology. A significant contributor to current medical literature, Dr. Kimball has presented her research at medical and scientific symposia worldwide. She received her medical degree from Yale University School of Medicine and her masters of public health degree from Johns Hopkins School of Public Health. What Is Nu Skin Clear Medication Action? Nu Skin’s Clear Action is an acne medication system that includes a foaming cleanser, toner, day cleanser and night treatment. Nu Skin Clear Action® Acne Medication System is a gentle but effective treatment system designed to help clear the blemishes you have now, fade the signs of past breakouts, and, most importantly, keep skin clear and vibrant for the future. ● Uses patented technology to help improve the appearance of uneven texture and skin discoloration from past breakouts. ● Clinically proven to reduce acne and help keep skin clear of blemishes. ● Works to prevent future blemishes from forming. Is it true that when using a new system, acne may seem worse before it gets better? Skin usually takes a few days to adjust to a new regimen. We recommend that you start with one product and gradually add the remaining products one step at a time. Start with the Nu Skin Clear Action Acne Medication Foaming Cleanser. How long should one system last? One complete system of products has been packaged to last approximately 30 days. During tests, Nu Skin Clear Action showed significant results after 12 weeks. However, results could be visible earlier. Below is a description of each of the four products that comprise the Nu Skin Clear Action System, along with an explanation as to how each one works to treats acne. With regular use, the combination system can help yield a smoother, clearer complexion for most people. Nu Skin Acne Medication Foaming Cleaner uses salicylic acid, an exfoliate agent, which penetrates pores to help break up the oil and debris that can lead to breakouts. According to Nu Skin, it is formulated to prevent skin from feeling tight or dry. Nu Skin Clear Action Acne Medication Toner is used to help calm skin using the soothing properties of licorice and works to balance oil production through the powers of zinc PCA, a zinc complex that can help control sebum. Nu Skin Clear Action Acne Medication Day Cleaner contains three key ingredients: mandelic acid, an alpha hydroxy acid (AHA) agent with useful anti-aging and antibacterial properties, helping to fade discoloration and uneven skin texture caused by previous breakouts; salicylic acid to keep pores clear; and white tea extract, an antioxidant that helps skin protect itself against environmental aging effects, while helping to restore skin’s natural resilience. Nu Skin Night Acne Medication Night Treatment combines the clearing effects of salicylic acid with retinol, a form of vitamin A known for its anti-aging qualities, and a patented alpha lipoic acid that functions as an antioxidant. Together these three substances work to repair discoloration and uneven skin texture stemming from former breakouts, while preventing new ones from occurring. 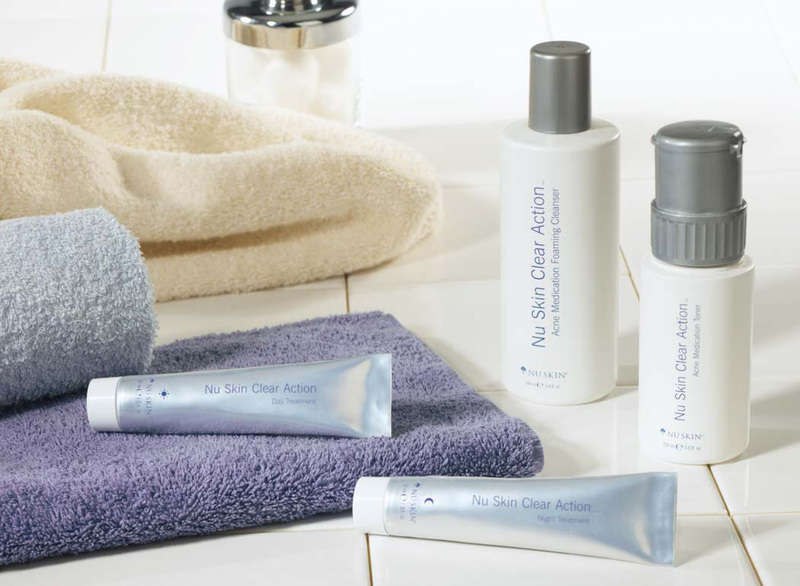 Each product in the Nu Skin Clear Action System is intended to be used on a daily basis. In the morning, Nu Skin recommends applying the foaming cleaner, toner and day treatment. At night, the company recommends again using the foaming cleaner and toner, followed by the application of the night treatment. Through use of the Nu Skin Clear Action System, users may experience a reduction in pimples and redness, and improvement in skin’s clarity, texture and radiance. It is not intended to treat skin conditions other than acne, such as rosacea or eczema. Rejuvenation system in Ireland I was suggested this blog by my cousin.